A client once asked me “what brings you joy?” At the time I had difficulty answering, perhaps it was because it was the end of the day and week and I was a little tired. There are many things that bring me joy including the Grouse Grind® which provides a close by escape from the city. Since picking up the timer card in 2009, I have climbed the Grouse Grind® over 125 times. Although, it has been a couple of years because my son was born, there are several reasons I would go to Grouse Mountain multiple times per week before his birth. The Grouse Grind is an iconic Vancouver hiking challenge. Getting to the top can be daunting, yet cresting over the top to see the stairs of the resort building is exhilarating and relieving. Once you are at the top, turn around for another breath taking experience, the view. Those who haven't done the Grind, wonder what possesses people to subject themselves to such physical exertion. We get so busy during the day that we can lose contact with the beauty that surrounds us in Vancouver. Taking time to ﻿﻿hike in the forest is good for our mental healt﻿﻿h. During the evening the trail is often quieter and more relaxed. There are sections where you could even be alone. On rainy days it's mostly those who are dedicated Grinders who visit the mountain.The rainforest canopy at night after or during the rain is absolutely gorgeous. My family travelled from Saskatchewan to Alberta during the summers for overnight week long hikes in the Rocky Mountains. Now living in Vancouver I appreciate the landscape and forest trails this city has to offer. It would be a shame to neglect the beauty that is in my backyard. Each climb provided time and space to be my introvert self, reflect, and calm my nerves from running a business while reconnecting with the earth. The 2,800 steps offer an unparalleled opportunity to challenge my physical capacities. I grew up competing in cross-country skiing and biathlon; it was the hills that I was able to catch people on. When I was a regular Grinder, each season I continued to push myself to see how fast I could get on the Grind®, with the aim of being the fastest in my age group. It is a set course that is measurable. The timer card combined with a heart rate monitor makes it very easy to see changes in fitness as well as chart age group progress. My fastest time was just over 37 minutes. There are even couple of races up the Grind including the Seek the Peak and the Grouse Grind Mountain ﻿Run. Being among the fittest in my age group will keep me physically younger, prevent injuries and chronic medical conditions while continuing to inspire others to challenge their own physical limitations. Increasing your stamina leaves you with larger energy reserves so that at the end of a long work day that is physically or mentally taxing you will be less fatigued. For years I struggled with depression due to school bullies. They thought that biathlon was a sissy sport – though we were skiing 10-20 km per race, with a rifle on our backs and competed in two races per weekend; this was until I skied circles around my classmates during a PE outing to Cypress. I strongly believe that this lack of self-confidence prevented me from reaching my potential in the sport. Just cresting the top always makes me feel great and like I have really accomplished something. This endorphine kick lasts most of the day and spills over to other activities. Setting new persona﻿﻿﻿﻿﻿﻿﻿﻿﻿﻿﻿l bests, didn't happen every climb, but when it did I felt fabulous for several days. It provided something to celebrate; it gave me more confidence and belief in myself. This renewed confidence assists me with feeling like I can do what is necessary to grow my business. I climbed to show those who thought that I wouldn’t accomplish much that I am physically capable of great things. Although I am an introvert and I like to climb alone, part of the reasons I went to the mountain is to see friends who share a common interest. There's a group of us who go up multiple times per day (something I once thought was CRAZY). They participate in the Multi-Grind challenge on the longest day to see We all encourage each other to push our limits, support each others’ goals and celebrate our accomplishments. When you ascend the Grind® as often as we do – you get to know the wonderful Grouse Mountain staff. Also, it is always nice to say hello and encourage people on the trail who are sharing similar experiences, but might be climbing for their first time. Even though I don't go often anymore, I am still in touch with those whom I met several years ago. We see each other at other running events throughout the city. 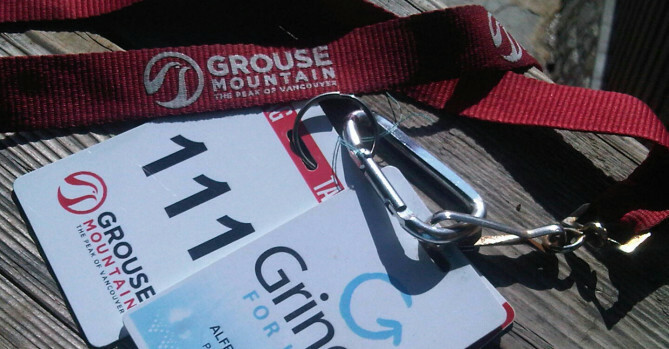 Grind for Kids was started by one of the friends I made while climbing the Grouse Grind. The children's hospital is important to me because I was very ill as a child, the care I received made a significant difference in my life. Every grind counts towards raising money for BC Children's Hospital. Participants have raised over $1 million dollars. Have you tried the Grouse Grind? What are your reasons for taking on this Vancouver Challenge? original post adapted from author's personal blog.